Don’t go it alone! When it comes to the job search, your spouse can lend ears, eyes and hands to help you find the right fit. Securing a new job is an exciting step in your journey toward practicing medicine, but the job search itself can be a lengthy and time-consuming process. If you have a willing spouse, partner or significant other, the perfect assistant may be right by your side. They can play key roles—from keeping the job search organized and making initial contact, to acting as a sounding board as you evaluate your options, to traveling with you to on-site visits. Developing a plan for working together can make the process run more smoothly and help you avoid costly errors down the road. Here are some tips for teaming up. It may sound like a simple step, but having someone else look over your documents before you send them off can be critical: You won’t make a strong initial impression if your CV contains errors, typos or vague information. Your spouse or partner—keenly aware of your goals—is in a great position to look over your materials and offer input. At minimum, a quick proofread is always in order; your own familiarity with the documents can easily result in overlooked errors. But if your partner’s talents are in writing or English, solicit more feedback. Is your background clearly spelled out? Are you sounding too modest, or too confident? Is each cover letter properly tailored for the desired position? Incorporate their feedback to improve your materials. A major job search can generate an overwhelming surge in correspondence, especially when relocation is a possibility. A spouse available and willing to take on the task can play a vital role in keeping information organized. Entering your CV and contact information into job banks, such as PracticeLink.com. Recording job inquiries made by you and noting the manner of them (online, by phone or other). Generating a list of all recruiters’ names and contact information and making note of those already contacted. Making note of all responses received. Keeping a list of action items and items in progress. Giving each job prospect an interest level: high, medium or low. Making note of the reasons for deciding against any opportunities. A spreadsheet is a good way to track incoming and outgoing correspondence. It also provides both of you with a document that you can quickly scan for a snapshot of your current situation. If you’re working unconventional hours, returning phone calls can be difficult. In addition to monitoring the flow of information, your spouse may be willing to be your first point of contact—making preliminary phone calls or writing email responses. Most in-house recruiters consider this standard procedure. “I’ll often talk to the spouse initially, who will explain the job is for her husband, who’s at work,” explains Cheryl Weisenberg, physician recruiter at AdvantageCare Physicians in New York City. Though recruiters are used to interacting with physicians’ spouses, be sure that communicating via your spouse doesn’t go on too long. Steven Shasteen, senior physician in-house recruiter at Alaska Native Tribal Health Consortium, says recruiters are also eager to connect with the actual candidate. In addition, there are legal issues involved. “For example, with compensation, I need to speak directly to the physician themselves. They can share the information with their spouse, but I can’t do that,” adds Weisenberg. Picturing where you’ll eventually work is probably something you’ve done for years. Now that you’re about to jump deeper into the job search, your spouse plays a key role in helping to establish search criteria. Together you should discuss all the factors involved with a major move: desired location, community, educational and professional opportunities and more. (For a list of factors and considerations to get your conversations going, see the sidebar.) Be honest and don’t hesitate to question or even disagree with each other. For example, if your husband is an avid skier but cheerfully agrees to the idea of moving to Florida for your career, dig a little deeper to discuss how that arrangement would work for him. Once you’ve settled on some basic criteria, keep your search within those parameters; don’t waste time exploring an opportunity that one or both of you strongly opposes. Weisenberg has seen cases where that has resulted in conflict. “I worked with a young graduate from California, and the spouse didn’t want to move to New York City. Unfortunately, the situation ended in divorce; (the spouse) would not come,” she recalls. Manish Mehta, M.D., wound management and hyperbaric medicine physician at Orange County Wound and Hyperbaric in Santa Ana, California, recalls that discussing and evaluating criteria with his wife, Renay, was a key factor in finding the right position. Your new destination has to meet the needs of everyone in your family. Both you and your spouse should consider the following factors separately, then discuss them together to compare notes. Identify which factors are most important. For example, if your spouse is working on a degree, proximity to higher education may take priority over a less pressing consideration such as nearby shopping options. Climate: predominately warm, cool or four-season? Type of town: urban, suburban or rural? Neighborhood feel: active, family neighborhood or busy, independent professionals? Outdoor recreational features: ocean, mountains, lakes, etc. By taking these factors into consideration now, you’ll be able to determine how well each opportunity meets your family’s needs—ensuring you find a better fit in the end. All members of your family, including children or extended family living with you, will be affected by the changes accompanying your new job. Your spouse can help to make sure everyone’s needs are factored into the discussion. Ask them to devise a list of the factors important to the children or extended family, as well as anticipated changes over the next three to five years. Marci Jackson, physician recruitment manager at Marshfield Clinic in Marshfield, Wisconsin, agrees that considering the entire family’s needs goes a long way toward making a successful match. “If the children are in middle school or older, their needs are almost as important as the adults and may have significant influence in the decision,” says Jackson. School and child care are the obvious requirements, but don’t hesitate to give weight to any relevant hobbies, talents or interests. For example, if your rising hockey star ends up two hours from the nearest ice rink, or your budding political activist lands at a high school without a debate team, the long-term satisfaction of the family may suffer. “If the family isn’t happy, the physician will soon start looking for other career options,” says Jackson. While considering other family members’ needs, your spouse or partner may fail to give enough thought to their own situation. Be sure to ask them to take time out to consider their own goals and plans. If the job change will affect their professional path, spend some time discussing how they’ll adapt. Do they want to search actively for a job prior to the relocation or wait until after the move? If you are both in a medical profession, do you prefer to work at the same facility or separate? “Particularly in some occupations, such as IT, spouses want to find a job (before the move),” says Shasteen, adding that most recruiters will try to make introductions even outside of their realm of interest. Whatever your spouse decides, be sure you’re both on board with the approach. When physician Ryan Baker was finishing up his fellowship at UCLA, his wife, Kristina, had plans to continue her career in special education but was comfortable putting her job search on hold until after the dust from the relocation settled. “I wanted to get the family settled,” she recalls. “I knew I’d get my foot in the door somewhere and work my way to a position I’d want.” Within a few months of the move, she found a job she was happy with. “I was fairly confident she’d find work, given her interest in special education in general,” recalls Ryan Baker, who is now settled as a pediatric hospitalist and outpatient pediatric sports medicine physician at Providence Sacred Heart Medical Center and Children’s Hospital in Spokane, Washington. Once an opportunity begins looking like a serious possibility, most in-house physician recruiters will want to engage in a detailed conversation with your spouse or significant other. While they may have already spoken during preliminary conversations, this conversation will be different: Their goal is to get to know your family. Prepare for this conversation together by reviewing the joint criteria you’ve already established, as well as any other family needs, such as career or educational options. Once it comes time to hit the road for meetings and interviews, don’t plan to go it alone. Your prospective employer usually anticipates meeting all the decision-makers. Bringing along your spouse or partner helps present a unified front, relaying that you’re both informed—and on board—with the move. One recruiter recalls a situation in which a physician traveled from the East Coast for a site visit, but his spouse did not accompany him due to difficulties rearranging her work schedule and the schedules of their school-age children. The physician assured the recruiter that his wife was on board with the move, and he took the job. But it turns out that the couple wasn’t on the same page. In the end, the physician’s family only stayed in the new location for a month before returning back home. After several years of trying to make it work, the physician left to rejoin his family in their previous location. It may be tempting to travel solo for the first visit with plans to return together if a job seems promising. But due to the logistics involved, it can be tricky to set up another round of meetings or a second extensive tour. Plus, you never know when something will surprise you—an opportunity that seemed mediocre on paper may suddenly come to life when you’re walking through the hospital or dining with some potential co-workers. It’s best if you’re both available and present from the start. 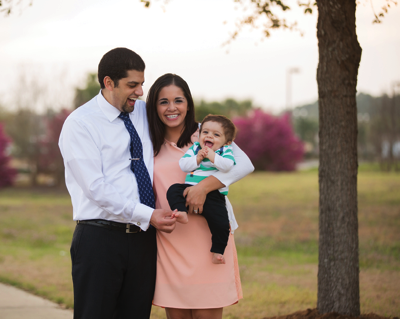 While considering a relocation from Florida to South Carolina, Akram Alashari, M.D., brought his wife, Karima, to visit the potential new employer. That helped her “get the vibe of the personalities working there,” Alashari says. Akram Alashari, M.D., surgeon and critical care physician at Grand Strand Medical Center in Myrtle Beach, South Carolina, says that the opportunity for his wife, Karima, to meet the faculty and staff of the hospital proved helpful in his recent job change and relocation from Florida. He says her input helped shed additional light on how the couple would fit into the environment. “She was able to get the vibe of the personalities working there, and she also got an understanding of their family situation so that we could have potential friends as opposed to just work partners [or] colleagues,” he recalls. Manish and Renay Mehta add that another benefit of traveling together was the opportunity to discuss things while the impressions were fresh in their minds. “Right after the interview [was a great time] to connect and discuss the pros and cons of the particular area and our areas of interest,” Renay recalls. A one- or two-night visit can go by very quickly, particularly if you are preoccupied with interviews and meetings. Having your spouse available to gather valuable impressions and tour the surrounding area will help maximize your visit. Obtain your agenda ahead of time so you both know what kind of free time is available. If you’re working with a recruiter, they may have already made arrangements for a realtor or someone else to provide a tour of the community. If not, be sure to make similar arrangements well ahead of time. Alashari says his wife was instrumental in exploring the community. “She met with a real estate agent to look at homes in the area while I was interviewing. This gave us a better understanding of the community and school systems while I assessed the work situation,” he says. As a result of their team coverage of the area, they both left with a good feeling about the prospective job, which Alashari ended up taking. As you navigate further along your journey toward achieving your professional goals, including your spouse as a key player in the job search will result in an outcome that benefits everyone involved.